Hello I'm Helen and I blog at Beautiful Things (www.allthebeautifulthings.co.uk) I'm guest posting for Mellissa while she enjoys some R&R. It's no secret that I love jewellery but lets face it what female doesn't! I like lots of different styles varying from quirky, fun, sparkly and statement pieces but also I really like nice jewellery, the sort that you wear on special occasions or make an effort to show it off. I do have to admit that I own alot of jewellery, over the past few years I have collected many beautiful pieces and quite a few of them hold lots of different memories. 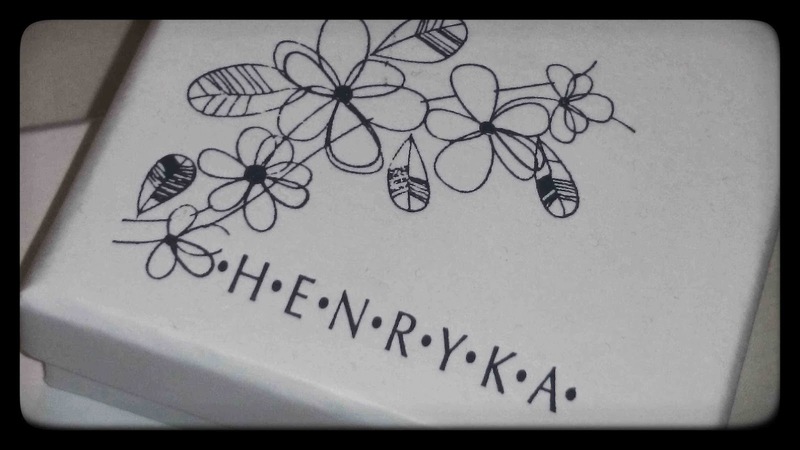 I have just recently discovered a company called Henryka who specialise in Baltic amber and silver jewellery which I also particularly like, on searching the site I couldn't resist a couple of cheeky purchases. I do truly believe that you can never have too much jewellery or too many necklaces so I chose two necklaces one from their sale range and the other non-sale and when they arrived it's fair to say I was pretty happy with my choices! The jewellery arrived in beautiful embossed boxes as you can see in the above pictures. Nestled inside them were two beautiful amber necklaces that I couldn't wait to wear. Both chains are sterling silver and are manufactured to a very high quality. Henryka, being a member of the International Amber Association means that you can be assured that they only sell genuine Baltic amber and Silver Jewellery Hallmarked in the UK. Amber has been around for years and years about 40-60 millions years, the Greeks and Romans were often seen wearing amber as it was believed to contain magical properties and to bring good luck. Amber is fossilised tree resin and is widely loved for it's colour and natural organic beauty. One of the legends that surrounds the Baltic amber in jewellery is the association with Jurata, queen of the sea who fell in love with a fisherman names Kastytis. According to legend her jealous father punished Jurata his daughter by destroying her amber palace and changing her into sea foam, it is said that the pieces of Jurata's palace can still be found on the Baltic shore. How cool is that legend!! 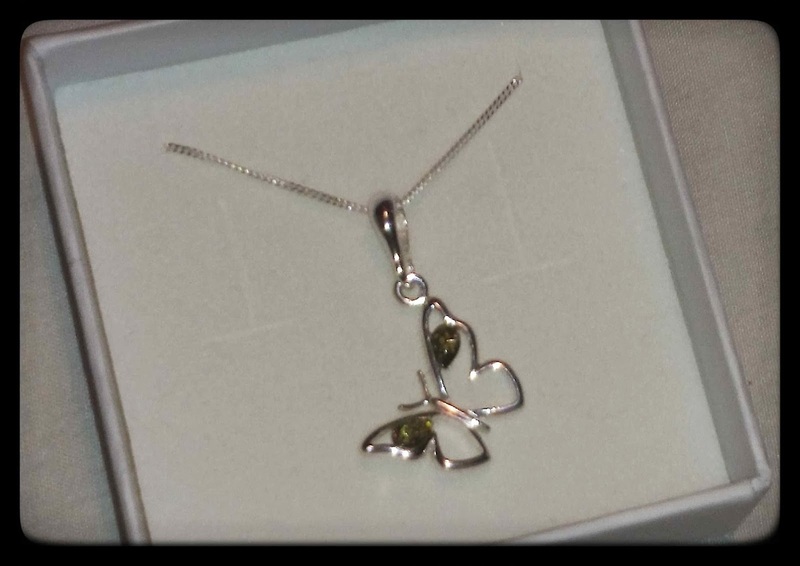 My first choice was a beautiful butterfly necklace from the Little Princess Trust Collection this cost £10.00 and all of the funds go to the charity which is dedicated to providing specialist wigs for children who are sadly suffering from cancer or hair loss. I think this is an excellent charity and I hope my buying this necklace can ease a child's suffering in some small way. You can read more about the charity by clicking this link to The Little Princess Trust. Butterflies are also sentimental to me, they were the theme for my wedding and when my Dad was poorly he gave me a butterfly necklace and since then they've remained a special part of my life. 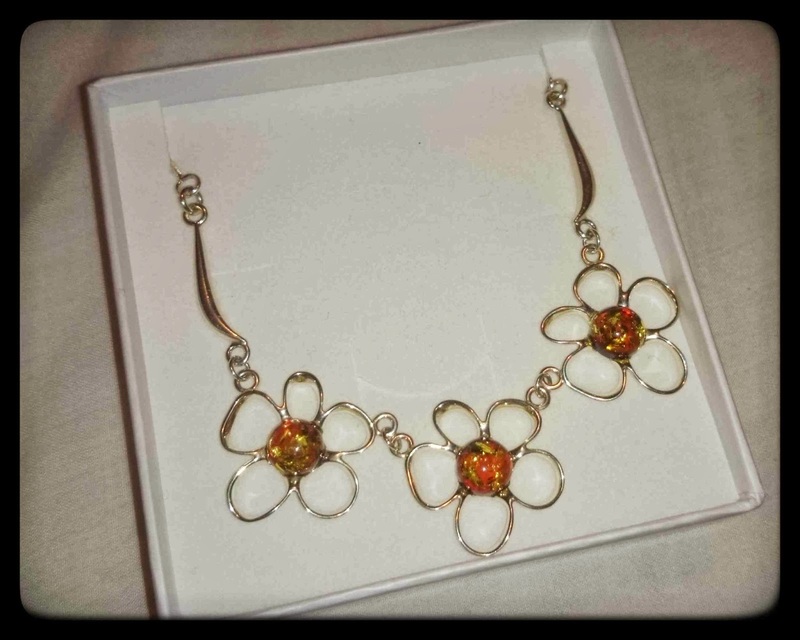 The other necklace I chose is unfortunately now sold out, it's a really pretty flower necklace featuring 3 daisies with small amber stones in the centre of the flowers. It's stunning, originally was priced at £60.00 but I paid less than half price for it. I think it's beautiful and as I said above amber is ever so versatile and can be worn with pretty much anything. I think what I particularly like about amber is the way it catches the light and is multi-dimensional, it can look so beautiful and different from various angles and I love that about it. I find it very pretty and I look forward to wearing both these necklaces and adding them to my ever growing collection of jewellery. Thanks for guest posting Helen. I love amber too, the flower necklace is particularly pretty. Simply gorgeous, can never have too much jewellery I say. I love the butterfly- gorgeous! The butterfly is very sweet. Oh I am a big fan of amber. Aaron had an amber teething necklace when he was a baby and it definitely worked. I love the way in which amber catches the light. The packaging is very pretty I agree! Oh those pieces are just stunning!! May have to invest in some amber pieces. They are lovely, amber is so beautiful. Oh, you do review some lovely stuff! I really, really like this, especially the flowers. I always try to wear jewellery, I especially love earrings. 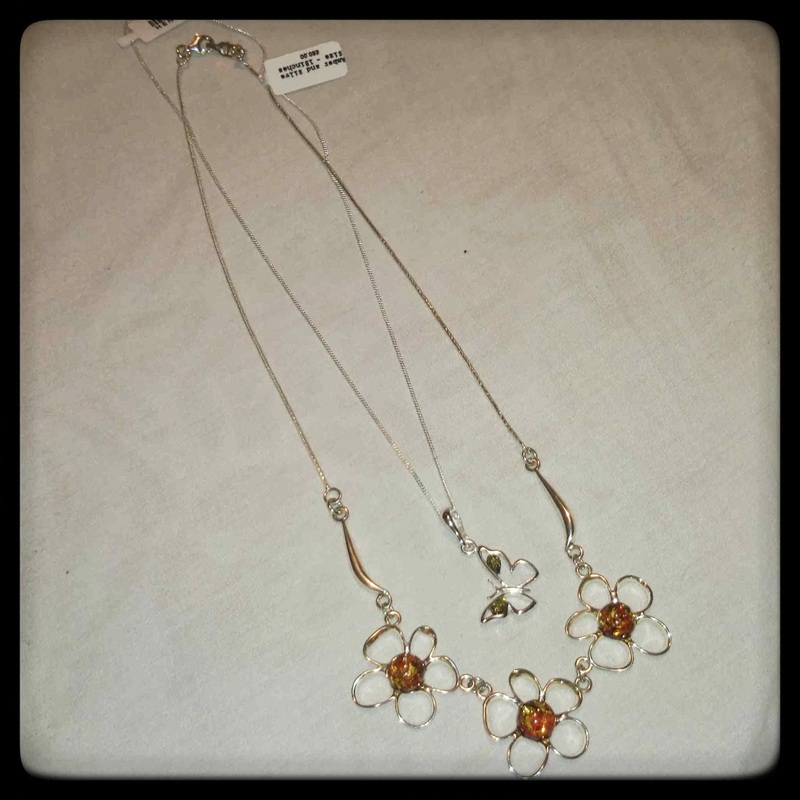 not really my style to be honest, but i quite like the daisy necklace! That is a pretty design. That is a great plus point! Pretty simple packaging and gorgeous jewellery too! That is just beautiful. I am a huge fan of silver and stones, so this is right up my street. I am glad you like it, I do too. The butterfly necklace is so pretty. Yes I agree with you, very simple and pretty. I love earrings I think I wear them everyday. Amber is lovely, it's such a warm colour too and flattering on the skin.